SAMSUNG Galaxy Tab S4 and Tab A 10.5" tablets announced. 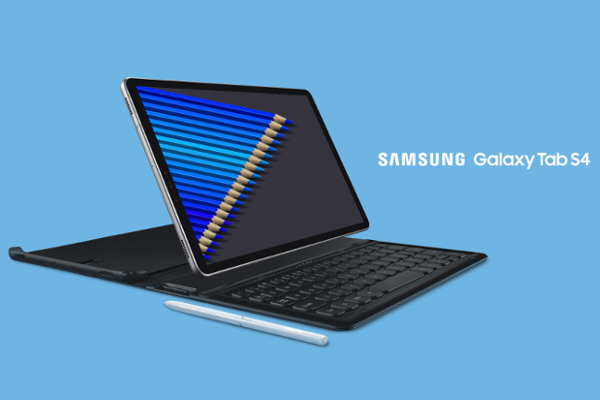 Samsung Electronics today announced the Galaxy Tab S4, a new 2-in-1 Android tablet with Samsung DeX, longer-lasting battery and the refined S Pen. Samsung today also announced Galaxy Tab A 10.5", a new tablet with enhanced audio and visual features, with added connectivity features like Samsung's SmartThings. 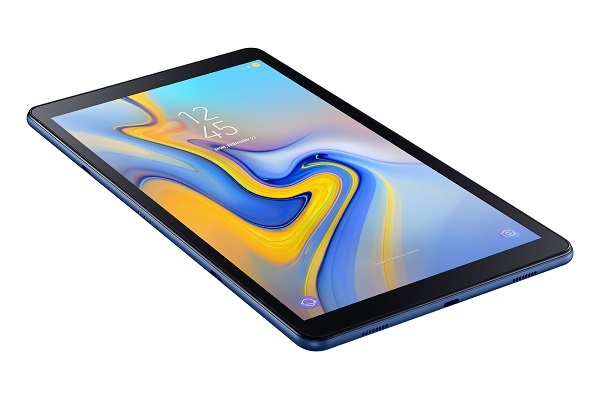 Galaxy Tab S4 sports narrower bezels to fit a large 10.5-inch display with Super AMOLED technology, as well as a 16:10 screen ratio with 2560×1600, 287 pixels per inch (PPI) resolution for vivid picture detail and true-to-life visuals. When it comes to audio, the Galaxy Tab S4 also comes with four speakers tuned by AKG and Dolby Atmos immersive sound technology. With Dolby Atmos, the Galaxy Tab S4 supports crisper dialogue, enveloping sound fields, maximized loudness without distortion, and consistent playback volume. The Galaxy Tab S4 keeps you going with a 7,300mAh battery that provides up to 16 hours of video playback. Additionally, with Samsung Knox, Samsung's defense-grade mobile security platform, customers and companies can ensure critical information is protected at multiple levels of the device. IT managers can also tailor the employee interface to align with business needs. Samsung's S Pen comes in the box with the Galaxy Tab S4 to satisfy even more productive needs. It offers users a great way to express their creativity and communicate. They can take notes on the fly through the Screen-Off Memo feature, as well as navigate, translate and organize notes through Samsung Notes, and even send personalized texts through Samsung Live Message - all with the S Pen. The Galaxy Tab S4 also features new and improved capabilities designed to manage your connected devices and lifestyle. Samsung Flow allows users to manage all of their devices easily by connecting and transferring files, tasks and notifications seamlessly. The SmartThings app on the Galaxy Tab S4 makes it easy to monitor and control your smart home devices right from the tablet. Plus, the Galaxy Tab S4's Daily Board allows you to view your favorite photos and everyday information such as the weather, calendar and time in one, easy-to-access place. The Galaxy Tab A 10.5" comes a 10.5-inch display featuring a generous 16:10 screen-to-body ratio thanks to its slimmer bezels. Four speakers are built into each corner of the tablet with support from Dolby Atmos, which transforms your mobile entertainment experience with moving audio that flows all around you. The Samsung Galaxy Tab A 10.5" also gives parents the control to manage content and usage time with Kids Mode, Samsung's child-friendly tablet interface designed to make learning and entertainment simple, safe and fun. This mode features Kids Browser, Galaxy Apps for Kids and eight free child-friendly apps from family favorite brands including Toca Hair Salon 3 and BRIO World - Railway. Families can also use Multi User Mode on the Galaxy Tab A 10.5" to create various accounts on the same device, such as one account for a child with separate accounts for the parents - for greater functionality on a single tablet. Samsung's Always On Daily Board brings integral daily information to one easy-to-view home hub including a clock, calendar and weather updates as well as a digital photo library. And now users can easily control their home environment from their family-friendly tablet with SmartThings on the Galaxy Tab A 10.5". Control your connected home appliances via SmartThings with the touch of a button. Whether you're getting the kids ready for bed or need to turn up the heat during a rainy day, smart home controls make it easy to manage your connected home. The 64GB variant of Samsung Galaxy Tab S4 is priced at $650, while the 256GB variant cost $750. The Samsung Galaxy Tab S4 will start shipping starting August 10th. The Galaxy Tab A 10.5" pricing is not yet revealed by Samsung.